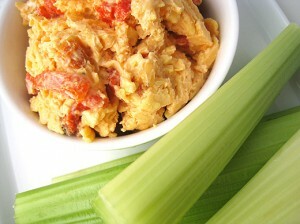 Pimento cheese is a very popular item in Southern cuisine. It's made from a base of three ingredients: cheese, mayonnaise, and pimento chili peppers. These are combined to make a paste used as a sandwich spread or dipping sauce. A pimento cheese sandwich is even one of the traditional menu items served at The Masters golf tournament. It's not diet-friendly by any means. But with today's focus of eliminating processed foods and introducing substitutes that are both fresh and accessible, celebrity chefs and restaurateurs across the nation have taken it upon themselves to re-invent this Southern staple. For example, Bobby Flay's bare-bones interpretation eliminates processed foods while keeping the essential ingredients intact. It's a combination of white and yellow cheddar cheese, homemade mayo, roasted red peppers, and cayenne pepper. He often uses this spread for his Pimento Cheeseburgers, served on brioche rolls. While Thomas Keller avoids making pimento spreads at his restaurants, he'll still indulge at home. Keller substitutes crème fraîche for mayonnaise, then adds chopped pimentos and smoked paprika. It's one of his favorite variations on a grilled cheese sandwich. San Francisco chef Scott Youkilis of the Hog & Rocks bar uses piquillo peppers, a chili found in the northern region of Spain, instead of pimentos. While still keeping cheddar cheese and mayo in the recipe, Youkilis completes his Spanish fusion spread by adding aged Mahón cheese, a slightly salty variety from the Mediterranean island of Minorca. At Van Horn Sandwich Shop, a Brooklyn deli that puts a New York twist on Southern fare, owners Jacob Van Horn and Rich Hauchman serve a signature BLP -- bacon, lettuce, and pimento. Standard ingredients are kicked up a notch with roasted red peppers, chipotle peppers, and Parmesan cheese. Stitt uses several splashes of Worcestershire, yet just a hint of Tabasco. It's not on the regular menu at Highland's, but diners can request it as a crudité dip.